Genetic offer a range of mostly very good value products, from bottom brackets to headsets, and almost everything in between. The Flare bar is one of their most interesting, with an 11-degree flare to the drops – hence the name – that proved very comfortable, offering plenty of hand positions and good control. The bar is made of 6061 T6 butted, heat treated aluminium alloy, which makes it robust, if a little on the heavy side – our 42cm test model came in at 325g, which is fairly heavy in the grand scheme of things, though about right for a £29.99 bar. The tubing is 23.8mm diameter, with a 31.8mm stem bulge for clamping. The Flare is actually a compact bar in all but name, with a 130mm drop and 80mm reach. The flare adds 40mm to the width (bar widths are measured at the lever clamp area). It also has an anatomic, or pistol grip, shape, which is fairly rare nowadays; the only person of note really using this shape on a day-to-day basis – though he probably won't be for a while now – being Fabian Cancellara. I found the bar surprisingly comfortable when in the drops. Having always ridden with either regular compact bars or track drops, I was initially sceptical of the benefits of a flare. I was worried primarily about shifting my hands to reach the levers. In reality it wasn't a problem at all, the levers are simple to reach – even allowing for single finger braking, if you're into that sort of thing. In fact I found that it gave me greater control over the bike when in the drops, though adopting an aero position was more of a challenge. Flared shapes tend to be used more in cycle-cross or gravel racing, so aren't necessarily going to be found on a traditional road bike, but if you are looking for stability you could do worse. One aspect I really liked was that the flare and pistol grip give you loads of possibilities for where to put your hands. Even in the drops you can be at the front of them at a slight angle, or at the back which feels like it is considerably more. The bar itself is fairly stiff and didn't flex too much when really pulling on it during climbs. This does mean it's a fairly harsh ride, and I was grateful for the padded bar tape I'd used. Of course, this isn't a bar that you would find on a top end machine, but if you're on a tighter budget or even if you want to have some more flexibility in hand placement, it works well. One downside I found, which I am sure I would learn to get over in time, is when leaning the bike against a wall. With a traditional flat sided bar the bike will sit flush, but the flare means you have to carefully balance it against a far smaller area. Once or twice I had to quickly grab the bike before it fell after I'd propped it against railings or a wall at a coffee shop. For the variety of hand positions the Flare gives you, and the good degree of control the shape provides, £29.99 is a good price. It won't be for everyone and I doubt you'll see this in the professional peloton, but I enjoyed using it. Genetic say: "A great design for CX and gravel racing, as well as a neat option for touring or commuting." It provides more control when in the drops and I would say that with the long days in the saddle that touring has, the multitude of hand positions would work well for many. 6061 T6 butted, heat treated aluminium alloy. 38,40, 42 or 44cm widths. Widths are measured at the lever clamp area. (Flare adds 40mm to the overall). It's heavy at 325g but uses a decent aluminium alloy that creates little flex even when pulling hard. Works well and allows for a decent level of control and hand positioning. Feels solid, likely to last a long time. 325g is heavy, but this is never going to be a bar for the weight weenies. The variety of hand positions mean that you can always find somewhere you feel comfortable; lack of flex could be uncomfortable without padded tape, though. £29.99 is a decent price. Performed well, certainly gives you an extra level of control in the drops and it's good to have many hand position options. I liked the choices in where to put your hands, especially on longer rides; it meant that I could always find a comfortable position. The Zipp Service Course SL has a bit of a flare — not much, but it's there. 30 quid bars won't be seen in the peloton period. Review suggests 3.5 stars mean at the price though. But there are bars for half of the price which are great.. Deda RHM, FSA Omega, etc.. Even basic Bonty bars (evans-bontrager) has very nice curve and compact form. How does this compare with something like a Midge bar. Those are great but I would like something narrower for the road. Are these an update on ye olde randonneurs? As this article has been resurrected by the "10 best upgrades for your bike" article, I may as well mention that the original handlebars on an old steel six-speed 105 clunker road bike I bought over the summer has flared handlebars — 44 on the drops, and (IIRC) 40 (!) at the hoods. 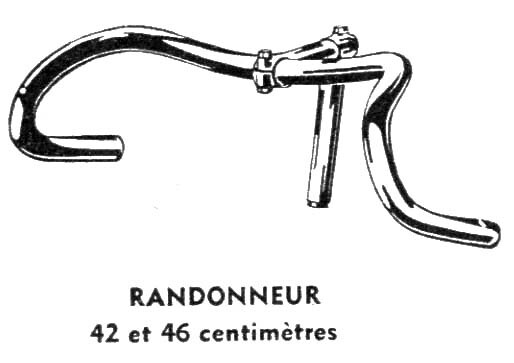 Flared handlebars are relatively common, and apparently have been around for a while.